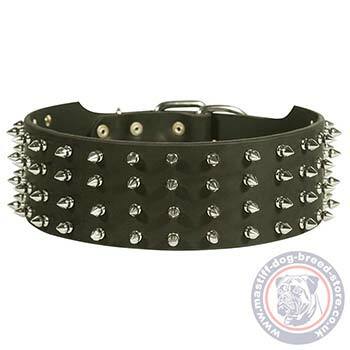 Wide leather dog collars are strong dog accessories for luxury look of your Mastiff. 2 in wide leather dog collars are very strong to handle an active large dog. Buy dog collars made of soft and strong leather, well-done, waxed and polished for reliable long-term use. 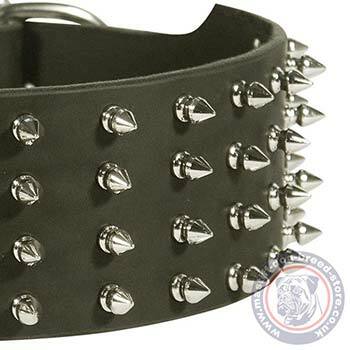 Perfect choice to buy dog collars for large dog breeds like Mastiffs: French Bordeaux Mastiff, Old English Bull Mastiff, Neapolitan Bull Mastiff etc. So, each collar has 2 additional holes by the sides of the cental hole to regulate the collar size. Wide Leather Dog Collars are especially handmade for large dog breeds. Our specialists took into attention all the details to make these dog collars super comfortable, extremely durable and luxury looking to bring pleasure and effectiveness in use. Buy dog collars of the best quality from the producer directly!